Islamic State claimed responsibility for suicide bomb attacks on Brussels airport and a rush-hour metro train in the Belgian capital on Tuesday which killed at least 30 people, with police hunting a suspect who fled the air terminal. Police issued a wanted notice for a young man in a hat who was caught on CCTV pushing a laden luggage trolley at Zaventem airport alongside two others who, investigators said, later blew themselves up in the terminal, killing at least 10 people. Officials said about 20 died on the train close to European Union institutions. Islamic State said that too was a suicide attack. The tolls were vague because of the carnage at both sites. The coordinated assault triggered security alerts across Europe and drew global expressions of support, four days after Brussels police had captured the prime surviving suspect in Islamic State's attacks on Paris last November in which 130 people were killed. Belgian authorities were still checking whether the attacks were linked to the arrest of Salah Abdeslam, said Federal Prosecutor Frederic Van Leeuw, although Belgian security experts said the level of organization involved suggested they had been in preparation for more than just a few days. As the city began to emerge from a day of lockdown, a major police search operation was still under way after dark in the northern borough of Schaerbeek. Investigators said they had found a nail bomb and an Islamic State flag in an apartment. Private broadcaster VTM said police went to the area after a taxi driver reported driving three people to the airport and became suspicious when they did not let him touch their baggage. Last week, explosives and an Islamic flag were found during a raid on an apartment in the south of Brussels. Police also found a fresh fingerprint of Abdeslam's there, putting them on to his trail. It was not clear if Abdeslam had been involved at that stage in planning the airport attack. In a statement, Islamic State said "caliphate soldiers, strapped with suicide vests and carrying explosive devices and machineguns" had targeted the airport and metro station, adding that they had set off their vests amidst the crowds. It was not clear, however, that the attackers used vests. 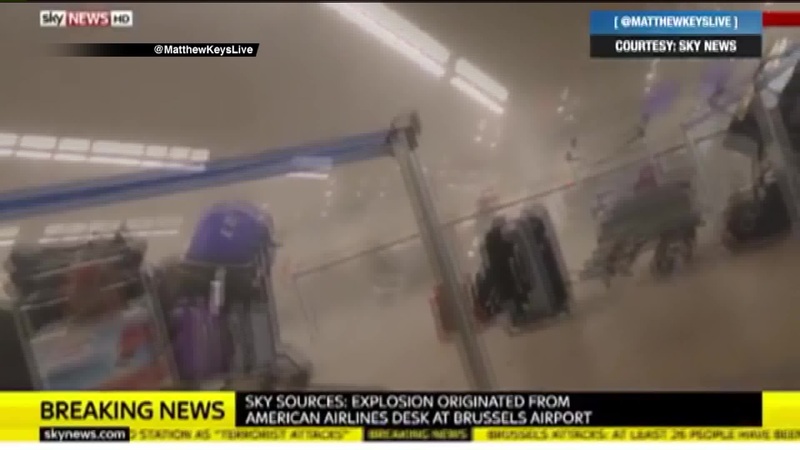 The suspects were photographed pushing bags on trolleys and witnesses said many of the airport dead and wounded were hit mostly in the legs, possibly indicating blasts at floor level. 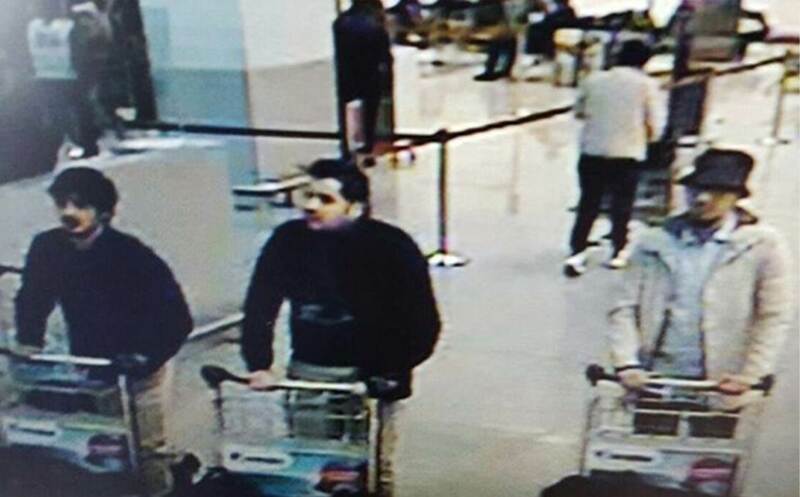 "A photograph of three male suspects was taken at Zaventem. Two of them seem to have committed suicide attacks. The third, wearing a light-colored jacket and a hat, is actively being sought," prosecutor Leeuw told a news conference. A government official said the third suspect had been seen running away from the airport building. Police later found and detonated a third explosive device at the airport. Security commentators noted that the two men in dark clothes who officials said had died were both wearing gloves on their left hands only. One expert speculated they might have concealed detonators. The man in the hat was not wearing any gloves. "If you recognize this individual or if you have information on this attack, please contact the investigators," a police wanted notice for the third man read. "Discretion assured." Belgian police appealed to travelers who had been at the airport and metro station to send in any photographs taken before the attacks in their efforts to identify the bombers. After questioning Abdeslam, police issued a wanted notice on Monday, identifying 25-year-old Najim Laachraoui as linked to the Paris attacks. The poor quality of Tuesday's CCTV images and of the Laachraoui wanted poster left open whether he might be the person caught on the airport cameras. Citizens of the United States, Spain and Sweden were among the injured, their governments reported. A witness said he heard shouts in Arabic and shots shortly before two blasts struck in a crowded airport departure lounge at the airport. Belgian media said police found a Kalashnikov assault rifle next to the body of an attacker. A lockdown imposed after the attacks was eased and commuters and students headed home as public transport partially reopened. Islamic State, which controls parts of Iraq and Syria and has supporters and sympathizers around the world, said: "We promise the crusader alliance against the Islamic State that they will have black days in return for their aggression against the Islamic State." Belgium, home to the EU and the headquarters of the NATO military alliance, has sent warplanes to take part in operations against Islamic State in the Middle East. Austrian Horst Pilger, waiting on a flight with his family when the attackers struck, said his children had thought fireworks were going off, but he instantly knew an assault was under way. "My wife and I both thought 'bomb'. 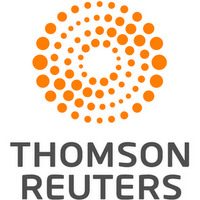 We looked into each other's eyes," he told Reuters. "Five or 10 seconds later there was a major, major, major blast in close vicinity. It was massive." Pilger, who works at the European Commission, said the whole ceiling collapsed and smoke flooded the building. U.S. President Barack Obama led calls of support to Belgian Prime Minister Charles Michel. "We must be together regardless of nationality or race or faith in fighting against the scourge of terrorism," Obama told a news conference in Cuba. "We can and we will defeat those who threaten the safety and security of people all around the world." Michel spoke at a Brussels news conference of a "black moment" for his country. "What we had feared has come to pass." In Paris, the Eiffel Tower was lit up with the colors of the Belgian flag on Tuesday evening in a show of solidarity with Brussels. The Twitter hashtag #JeSuisBruxelles was trending as were cartoons riffing on the theme of the city's irreverent emblem, Manneken Pis, a small fountain statue of a boy urinating. In the images, he is cheekily relieving himself on a Kalashnikov. Brussels airport will remain closed on Wednesday but the metro, trains and other transport will open, at least in part. Alphonse Youla, 40, who works at the airport, told Reuters he heard a man shouting out in Arabic before the first explosion. "Then the glass ceiling of the airport collapsed." "I helped carry out five people dead, their legs destroyed," he said, his hands covered in the victims' blood. Video showed devastation in the hall with ceiling tiles and glass scattered across the floor. Bloodied bodies lay around. Britain, Germany, France and the Netherlands, all wary of spillover from conflict in Syria, were among states announcing extra security measures. Security was tightened at the Dutch and French borders with Belgium. The blast hit the train as it left the platform at Maelbeek station, close to EU institutions, heading to the city center. VRT carried a photograph of a metro carriage at a platform with doors and windows completely blown out, its structure deformed and interior mangled and charred. "We are at war and we have been subjected to acts of war in Europe for the last few months," said French Prime Minister Manuel Valls, who is due in Brussels on Wednesday for a previously arranged visit. Train services on the cross-channel tunnel from London to Brussels were suspended. Britain advised its citizens to avoid all but essential travel to Brussels. Abdeslam, the prime surviving suspect for the Paris attacks on a stadium, cafes and a concert hall, was captured by Belgian police after a shootout on Friday. Interior Minister, Jan Jambon, said on Monday the country was on high alert for a revenge attack.